Apparently Anna had been laughing all afternoon while going through those boxes, and so took a few photos of the things she'd found because she wanted to share her joy with me. And I, in turn, want to share my joy with you. 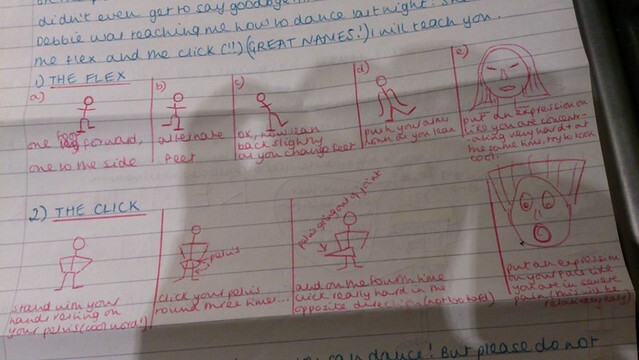 Like, for example, this very serious illustration of some new dance moves I'd just been taught by my friend Debbie. Whether Debbie herself was also being serious in teaching me these dance moves—or is in fact still laughing uproariously about the time she convinced me to actually do this with my body in public—will never be known,* but I thought they were worth sharing anyway in case you're thinking of hitting the club this weekend and clearing the dancefloor with your sweet new grooves. Be honest, did you try any of those just now? You did, didn't you? I know I made a few attempts at "The Click" myself, but apparently I'm just not as limber as I was aged sixteen because I couldn't quite get the hang of how to "click your pelvis round three times," exhilarating though it sounded. I did appreciate my helpful little illustration of the stick figure's "pelvis going out of joint," though, as well as the bizarre instruction to "put an expression on your face like you are in severe pain (this will be relatively easy.)" And how about "The Flex"? Anyone manage to nail an expression that shows you're "concentrating very hard and, at the same time, try[ing] to look cool"? Man, being sixteen is exhausting. As though a cheat sheet for 1996's hottest dance moves wasn't enough excitement, Anna also a enclosed a picture of what is probably my first known—and, let us all hope, only—drawing of Sean, whom we'd met together earlier that summer. My favorite thing, however, was the one-page fax Anna had saved from me, which was obviously sent sometime around the dawn of email. Once we realized letter-writing was too slow a medium to communicate our important teenage thoughts to each other, you see, but before anyone really had their own email account, Anna and I used to stay in touch during the summer vacation by sending faxes between Connecticut and Hong Kong. The risk that some other member of our family might see our most personal and intricate thoughts—and, what, try and imitate our dance moves?—was a concern, sure, but the speed with which we could consult on important matters like how to impress boys with knee braces and pagers was worth the potential embarrassment. Plus, we both just made sure to plant ourselves in front of our respective fax machines when we knew a missive might be coming in and scream "DON'T PICK UP! IT'S A FAX!" as soon as the phone started ringing. What is your email address (or screen name or whatever)? I want to try emailing you! Fax back as soon as you can! Don't you just love the urgency? The general fuzziness around how one might actually communicate via the computer? The request that she fax back to let me know she got my fax so that I could then attempt to email her? Oh sweet, precious, innocent 1990s. What a lot of paper we must have all wasted back then. Oh my GOD! Thank you for the laugh to start my weekend. We also had a fax machine and my best friend and I would fax one another silly notes. My parents also paid to have a toll-free 800 number so we could give that out to friends that otherwise would need to pay long distance charges. I told this to my 21 year old sister the other day and she looked at me like I was an alien. Sometimes I miss the 90's. Everything was so innocent and simple then. This filled me with SO much nostalgia. My parents both used to travel to Asia quite a bit when I was growing up and we used to fax back and forth a lot (I, too, remember the shiny rolls of paper!!). A lot of fond memories. :) Also, did you find that you could read the faxes on the shiny paper still? Several years ago I came across some really old faxes and found that the writing had faded badly on that type of paper. This was a much-needed laugh today. Thank you so much for sharing! Abslutely fabulous. 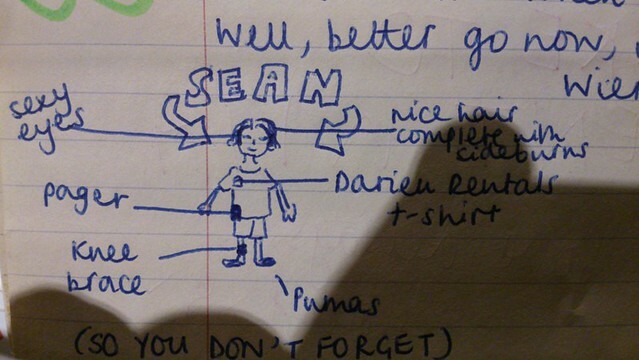 I think my favourite though has to be the pager on your drawing of Sean. I always giggle just a bit when I watch older movies where the characters have pagers...of the nostalgia! oh my god, yes! those shiny continuous fax papers! hah. I sadly had to wait till email was available in full force as my pals in the States didn't jump on the fax train like my pals in HKG did. What wonderful memories! Of all your posts, I love the 90s nostalgia ones the best! And I loved getting to meet Anna in the flesh at your wedding, putting a face to all the stories. My best friend and I used to write secret notes, and then drop them down behind a stairwell in the basement of her house. I always wonder if whoever lives there now ever found them. Excellent diagram construction, by the way! Hysterical over the Sean drawing - it's SO what I used to do, as well! I love it even more because you guys actually fell in love, got married, and made a Hamish. Love how far both of the relationships have made it. Wondering now where I've put all those pen pal letters from my youth -- and growing somewhat nostalgic for the paper and pen. Oh, would that you'd had that drawing of SEAN in time for your wedding. Think of what you could have done with the invitations. I love this so much! Considering I just found a box of letters from my BFF that were written 15 years ago. I was laughing so hard at the "dilemmas" we faced, the drama, the heart break, the BOYS! Those are precious letters I'll never give up!